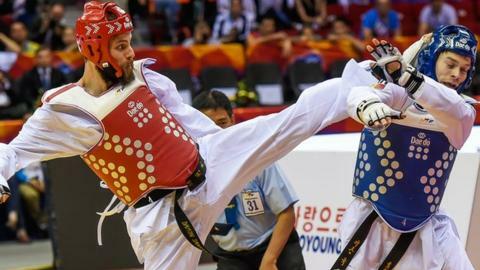 Great Britain's Damon Sansum beat Aaron Cook on the way to winning a silver medal at the World Taekwondo Championships in Russia. Samsun won the -80kg semi-final against Cook, who missed out on selection for Great Britain at the 2012 Olympics and now competes for Moldova. Sansum, 28, lost 16-3 in the final to Iran's Mehdi Khodabakhshi. Fellow Briton Rachelle Booth, 19, won a bronze medal after losing in the semi-finals of the women's -62kg. Booth, who only joined the Team GB set-up 18 months ago, was beaten 6-4 by Spain's Marta Calvo Gomez. Her bronze, added to the silver of Sansum and the gold won by Bianca Walkden on Sunday in the women's +73kg, means Britain hit their target of three medals with just over a year to go before the 2016 Olympics in Rio. Had Sansum won, he would have become the first British man to win a World Championship gold medal. His success comes only five years after joining the GB Taekwondo set-up after previously winning a world championship in kick boxing.